Last month, a number of translators, editors, and Lusophiles gathered in London and New York to discuss the titles chosen for this year’s And Other Stories Portuguese Reading Group – which, for the first time, features an all-Brazilian lineup. In the third of four blog posts, translator Julia Sanches discusses Lucrecia Zappi’s bleak and unsettling Acre. Acre. The westernmost state of Brazil, bordered by Bolivia and Peru, a land so distant that if you try to search for directions on how to get there from São Paulo, Google will apologise and inform you that your search appears to be outside their current coverage area. Acre. A unit of land area equal to 4,840 square yards, or more informally, a large extent of something. Acre. A flavour that is bitter, spicy, and corrosive. A strong and active scent. Showing bitterness. Figuratively, able to wound and irritate. Acre. A slender novel by Argentine-born and Brazilian raised author Lucrecia Zappi, about a Brazilian middle-class couple whose just-about comfortable little life in the centre of São Paulo is upended by the return of an old boyfriend. Acre, set between the coastal town of Santos, where the three main characters meet as teenagers—Oscar, our humdrum narrator, Nelson, a man with vitiligo running up his hands and arms, and Marcela, the caiçara beauty whose body language is that of a person always elsewhere—and the financial capital, São Paulo, where they are now next-door neighbours in the same apartment building. Acre, whose geography is also the past, filled with salt air, waves, teenage surf gangs, and a Brazil contending with the rise of drugs and AIDS. Acre, in which Marcela and Nelson disappear for three months, months Marcela cannot account for because she ‘can’t remember,’ even twenty years on, a mystery, or lack of clarity or light, that represents Oscar’s greatest source of disquiet. 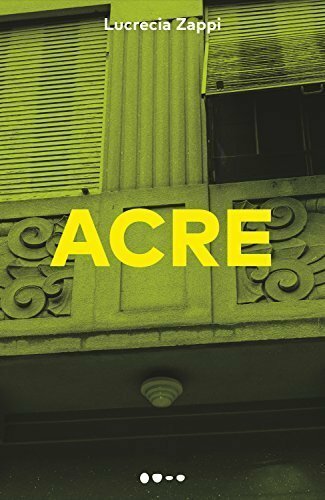 Acre, in which said disquiet seems to extend beyond the narrator, through the apartment building he lives in, through their neighbourhood, the city, the country, the world. Acre. Which gestures at a growing fear and violence toward the unknown, the foreign, the alheio that permeates the country, the globe. Acre, a remarkably silent novel where images are far louder and truer than words. Acre, in which Marcela likes to braid her hair and then sniff at its end; to lean far out of their ninth-story window and look out at the horizon, leaving layers of fingerprints on the glass; to roll bread into small, marble-sized pieces and chuck them out the window. In Acre, Marcela, whose name by no mere coincidence carries in it the Portuguese word for ‘sea,’ is a woman who smells of salt and lives in her own, private world. Acre, in which Oscar and Marcela’s relationship is marked by stillness. To those on the outside, it might look like disinterest or the absence of love, but between us that silence was a sort of smooth ocean. I felt that we had a kind of understanding, a cadence, an intimate seam made of few words, without disputes or disagreements. She didn’t always react to what I said. We didn’t have to entertain each other. Acre, which introduces into this married life of quiet routines a man who not only threatens their relationship, but their future. Acre, in which Nelson is the embodiment of this otherness, as if by living in Acre, on the frontier, he had taken on the characteristics of a borderland; an unloving son, who has abandoned his family twice, first his mother, then his wife and children; and a wanted man and convict who, while in prison, was someone’s ‘little husband.’ Acre, in which he is liminal and his liminality exists even on the surface of him, the spots on his hands had progressed up his arm. His scalp, the white contouring his left ear. The prints of some supernatural creature spreading across his body. Acre, written by an author with the eye of an artist and the ear of a playwright, an author who exists in between the world of the visual and the written word, and at least two countries in which otherness is framed as a threat. Acre. A novel told in photographic stills of defining gestures and the tight, resonant dialogue of a play. Acre, which as I read, reminded me of the intense discomfort I felt while watching Neighbouring Sounds, because in both there exists the notion that the idea of a menace is more potent than the menace itself.